I'm going to be away from the computer for about a week, due to Secret Family Business. Catch you later. Mercury, the Moon and Spica as seen above the western horizon from Adelaide on September 24th, at civil twilight (18:38 CST). Similar views will be seen at civil twilight (about half an hour after sunset) elsewhere in the Southern Hemisphere. 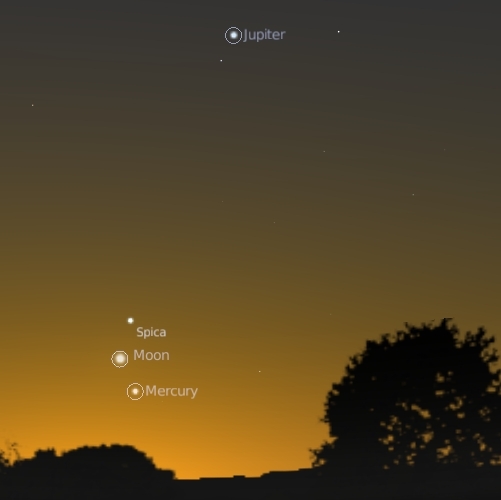 Over the next few days we will see Mercury, the Moon, Spica and Jupiter do some cool things. On Sunday 24th, the thin crescent Moon forms a triangle with Mercury and Spica. 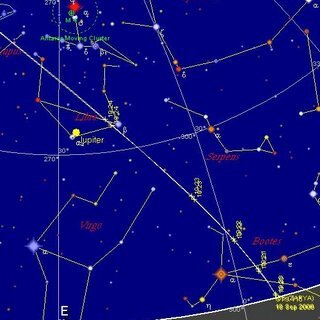 On Tuesday 26th the crescent Moon is near Jupiter. Over the week Spica and Mercury come closer, being closest (a fingerwidth apart) on Wednesday and Thursday (27th. 28th). Carl Sagan coined the term "Pale Blue Dot" for our world, and the iconic image is Earth rise over the Moon taken by the Apollo astronauts. For the first time we had an true grasp of our worlds place in space. Since then, it has been almost been de rigeur for spacecraft to take snapshots of Earth on their way into space. However this one takes the cake. This natural colour image is from Cassini, with Saturn blocking the Sun. The bright dot about 25% of the way into the image on the right is Earth (enlarged in the inset). See here for the full story and hig res images. Yes, that bulge on the enlarged image is the Moon. If you are going to be put in your cosmic place, the rings of Saturn are just the things to do it. The dim dot entangled in a ring 75% of the image width from the right is Enceladus. For a truly stunning high resolution image and more information see here. With the occultation, faint elements of the rings were able to be imaged for the fist time, the Enceladus image shows jets of material shooting from the poles and strange wispy structures entagling the Moon in the ring. Still more pictures and information are here. Hat tip to Nick Matzke at PT and Chris Lawson at Talking Squid. Check out this amazing image of the Shuttle and the ISS passing in front of the Sun (warning BIG file). The image was taken by Thierry Legault. If you want to see the ISS passing in front of the Sun or Moon, or close to a bright planet, sign up for the ISS transit email alert service. See here and here for some more ISS transit images. After watching the ISS last night, I was dismayed to read a New Scientist report of a toxic spill on the ISS. There is a very low key report on the NASA web site at the moment, ("crew detects odd odour"), but apparently the Elektron oxygen generator on the Russian side of the space station has malfunctioned and a small amount of toxic potassium hydroxide may have been released from an oxygen vent. The oxygen generator has been shut down, but there is enough back up oxygen supplies to keep them going. 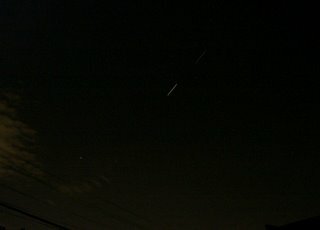 ISS, Shuttle and Jupiter. Wow!! 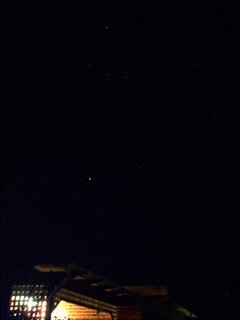 The ISS passes Beta Librae and Jupiter (as ever, click the image to enlarge it and see detail and faint stars) below Scorpius. Wowee!! That was awesome, and I do not use the word awesome lightly. It looked like I might not get to see the pass due to errant clouds, but although the clouds lurked to the side and the horizon, I was able to see first the ISS and the the shuttle rise up from the murk rapidly brightning. The ISS was much brighter than predicted (must be the new solar panels). 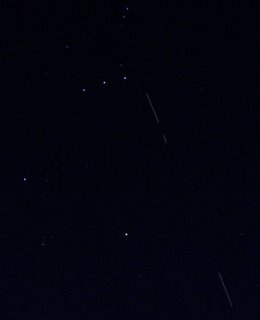 The first image on the left only shows the ISS, as the shuttle was too dim for the camera (although it was more than bright enough for me to see). The pair glided past Jupiter, looking absoultely amazing, and brightening as they went. They were probably brightest in the South West, just before reaching Trinagulum Australe. 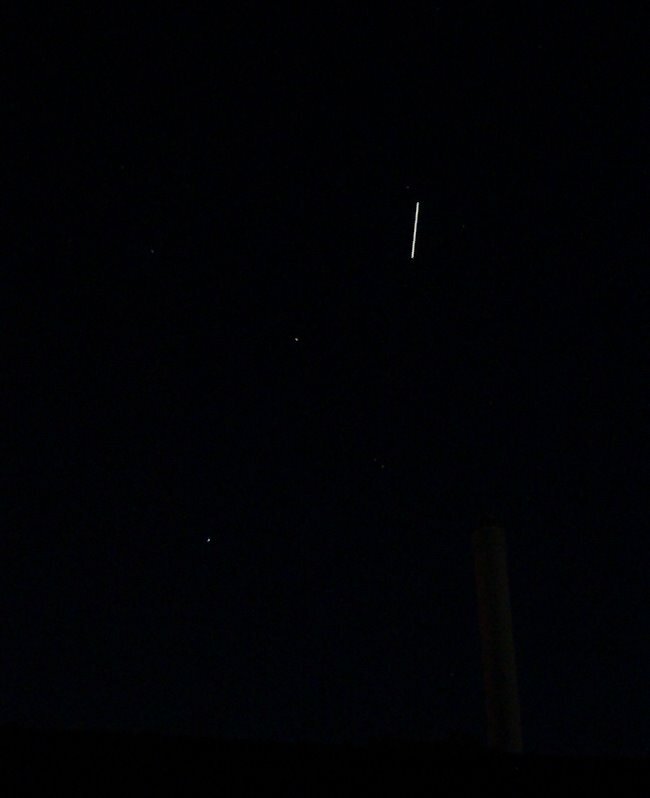 The the ISS began to fade, but the Shuttle brightened. 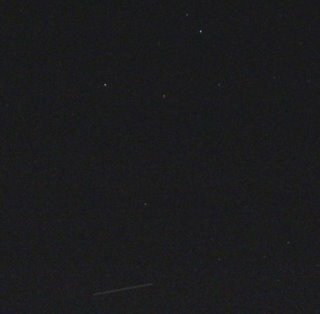 The bottom image shows the two together, you will have to click on the image to really see the shuttle (the dim trailing streak). The images do not do justice to their brightness. I kept on thinking, "There are people on those dots". People working in space. Something I dreamed about when I was a kid, and now a reality made visible in two bright sparks chasing each other across the sky. 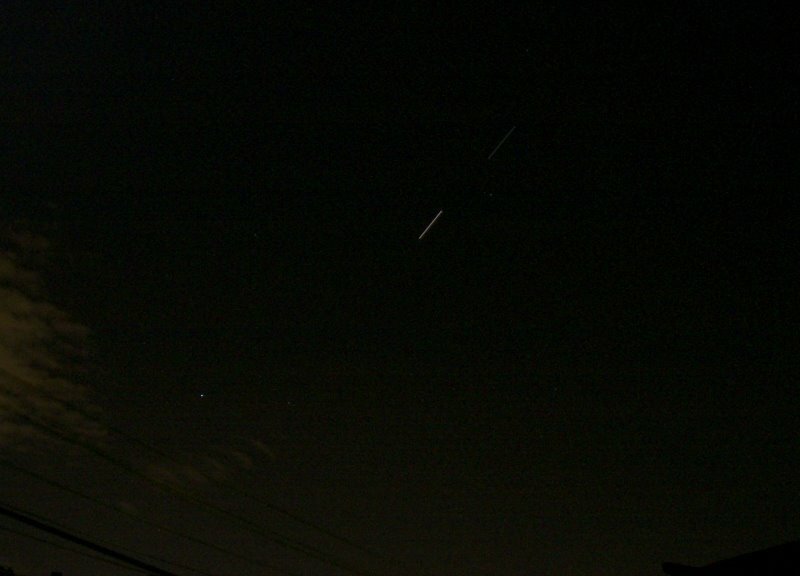 Path of the ISS and Shuttle mission STS-115 as seen from Adelaide at 19:20 CST. See Heavens Above for local predictions . 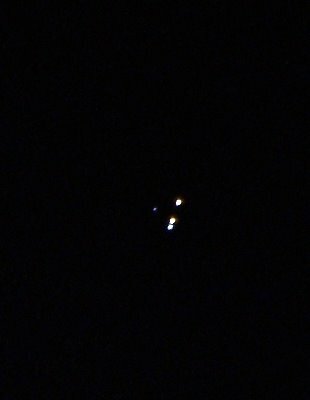 The ISS and Shuttle have just undocked, in preparation for the shuttles return on Wednesday.SO we get to see two bright objects tracking each other closely tonight. 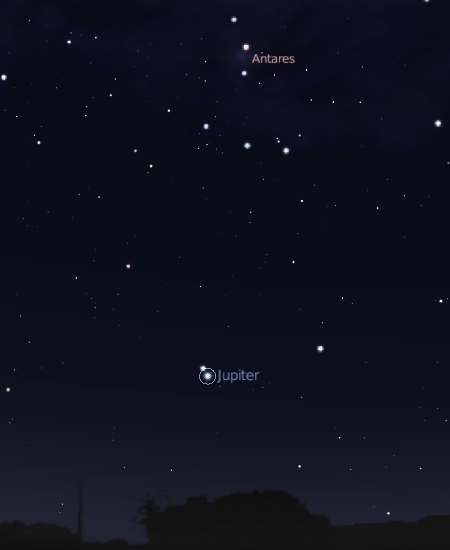 Once again, Brisbande(18:17 est) and Melbourne (19:53 est), see the pair pass almost on top of Jupiter. 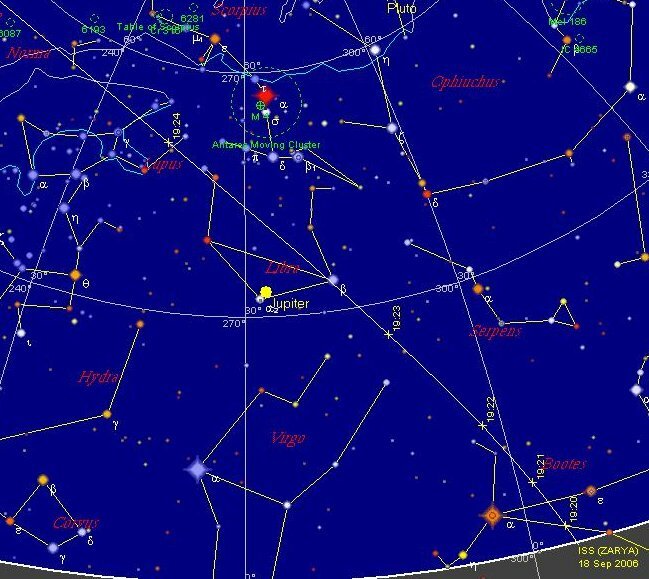 Adelaidians see them near by and Sydneyites (18:18 est) see a close pass to Altair. ...is now the Dwarf Planet Eris. Yes, UB313 has been officialy named. For more see the Bad Astronomer and Skepchick . 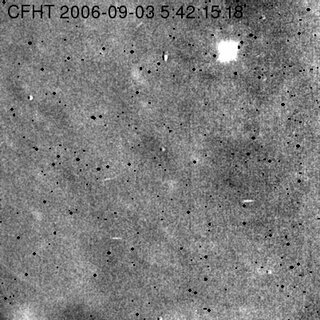 Update: the Bad Astronomer has found a blog that has a conspiracy theory about the naming of Eris. PZ Myers weighs in with some Eris-related conspiracy theories of his own. See also Mike Browns take on this. Jupiter slides past Zubenelgenubi in this series of images (interupted by rain, cloud, usual story). This is a stack of 6 images (two form each night over 3 nights). The latest full image is below, it is a stack of 3 images. 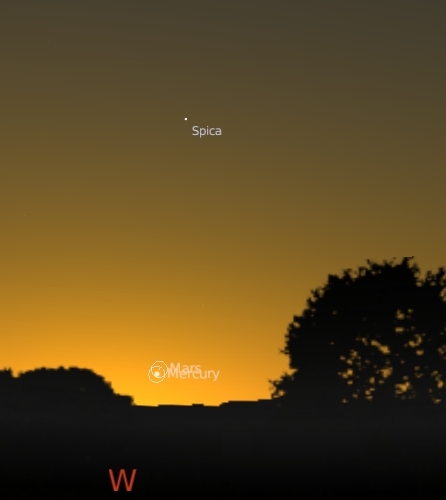 Mercury and Mars close together in the twlight of September 15. Theres a few interesting things coming up in evening over the next few days. 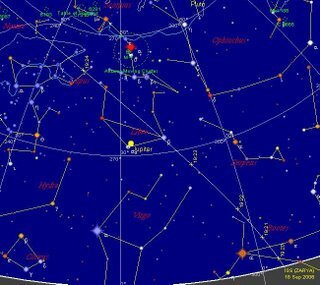 Tonight, Jupiter and Zubenelgenubi will be at their closest. On Frdiay, Sept. 15 Mars and Mercury will be very close together. Unfortunately, they will also be very close to the horizon. They will be only a handspan above the western horizon half an hour after sunset. This means you will need aclear level horizon to see them. While most of the ISS/Shuttle passes are in the early morning, there are two nice passes on the early evening of Sunday 17 and Monday 18. See Heavens Above for your local times. Adelide will see it go between Jupiter and the Head of Scorpio, while Sydney will see it go through Aquila. This time I thought I'd do it right. I got up at 5:10 am and set the camera up, rechecked Heavens Above for the latest prediction (STS-115 was coming upat 5:26:33, 1 minute later that the prediction last night,), and positioned my camera for the start of the track. You can see that below, STS-115 rising above our roof through Grus. Now Heavens Above (and the most recent orbital elements) had STS-115 rising 30 seconds before the ISS, but unlike yesterday I only saw one dot, so I suspect they had already docked. The rising pair were brightest just above my roof. 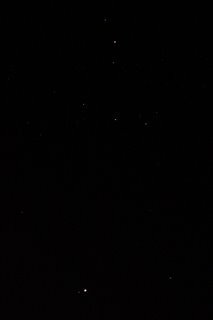 I then rapidly shifted the camera to Orion, where they were supposed to pass through. 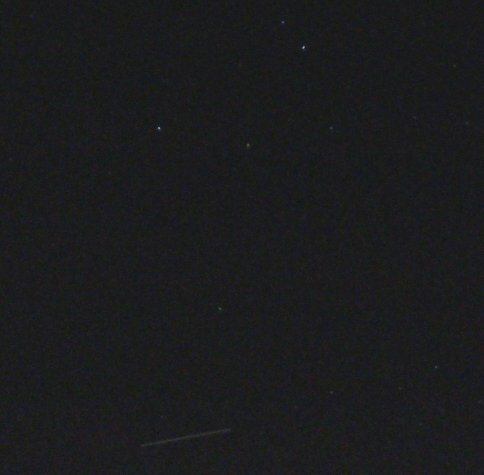 My set-up was off though, I only caught the bottom half of Orion and missed the STS-115/ISS going past Rigel (rats). 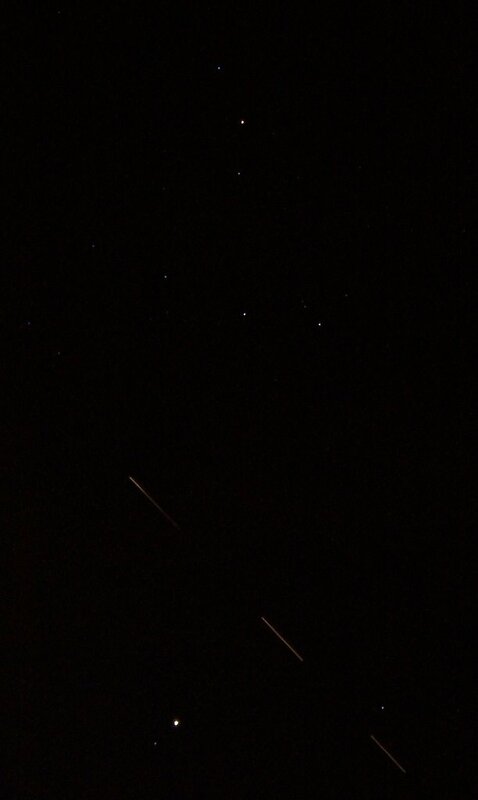 The Grus flare is a single image, the Orion image is an overlay of three images, capturing two sections of the STS-115/ISS track. Individual images had dark frames subtracted and were stacked using The Gimp. In the tradition of my faint fuzzy photographs, I present the trail of STS-115 (it's the dim streak down the bottom. 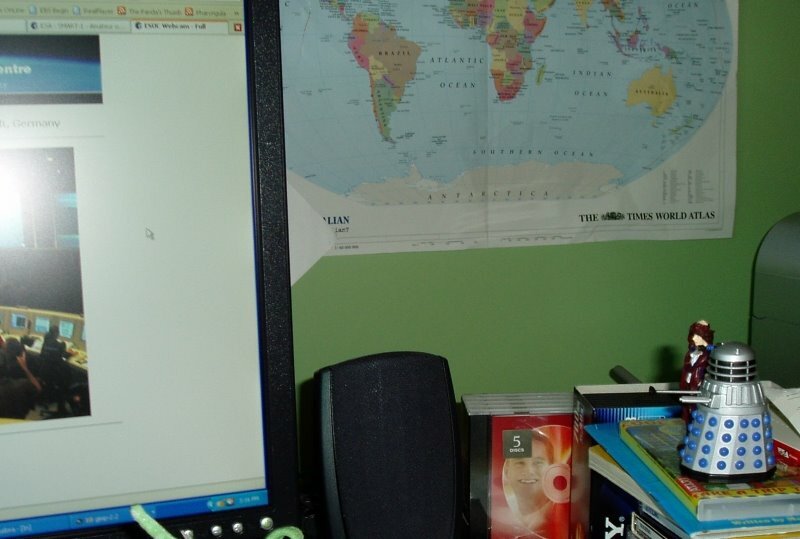 People with older monitors may struggle to see it, try clicking on the image to enlarge it). This would have probably been better with the film, rather than digital camera. 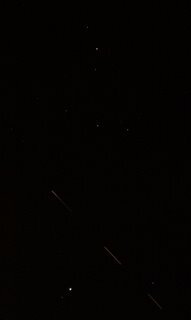 So I got up at 4:55 am and set up the Olympus, I set the camera up facing the Southern Pleiades, as both the shuttle and the ISS would pass below it. After some anxiety that I missed it (the Shuttle appeared about a minute after Heavens Above predicted it), a bright point appeared near Triangulum and began to glide across the sky. Unfortunately, the shuttle was at its brightest in triangulum, and dimmed significantly by the time it glided past the Southern Pleiades. So the picture isn't the best. 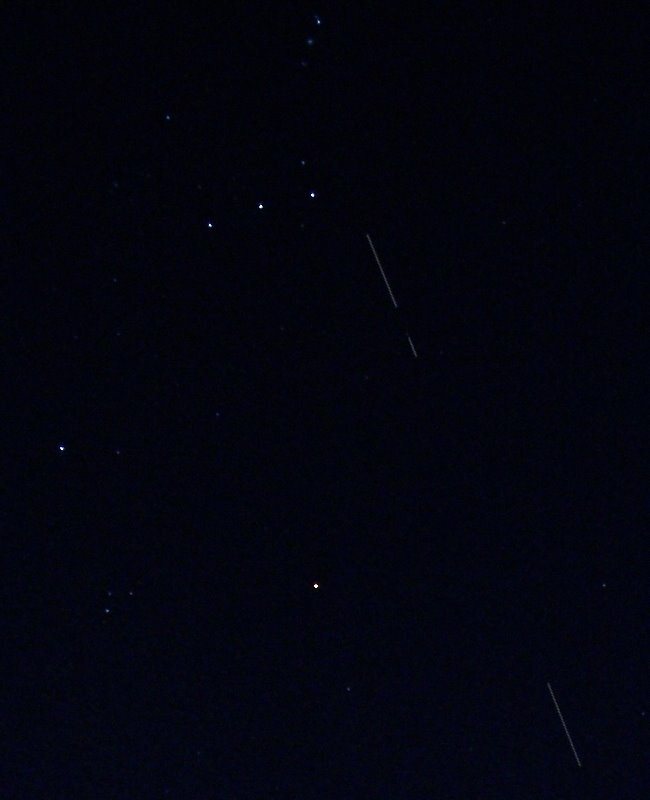 As the Shuttle headed for the eastern horizon, the ISS appeared, and followed almost the path of STS-115. It was a little bit dimmer than the Shuttle, but I got some images of that as well (which I will mercifully spare you. But there are far worse ways to spend a morning than watching the Shuttle and ISS fly past in the early dawn. Jupiter shines near alpha Librae. As usual click on the image to enlarge it. You will need to, the original image shows stars down to magnitude 5.5. The thumbnail doesn't even show Zubenelgenubi (alpha Librae). Watching Jupiter and Zubenelgenubi draw closer over the past few nights has been nice, but only tonight could I image them. And I was really pleased with how the image turned out (not that you would know it from the thumb nail). I took 4x6 second images on my Olmpus µ300 using the night image feature, and a dark frame (by putting the camera bag over the lens and taking picture. Each image was loaded into GIMP and the darkfame subtracted by loading as a layers using the difference feature of the layer menu to subtract the darkframe. Each image was saved individually, the realoaded again, with image 1 as the base image and the others as layers. The images were aligned using difffernce, then once alighed, adeed using, well, the add feature of the layer menu. Previously I' been using screen, but add works much better, and I got down to mag 5.5 stars with no trouble. Colours were failry obvious on the original and the 800x600 scaled version I've uploaded here. 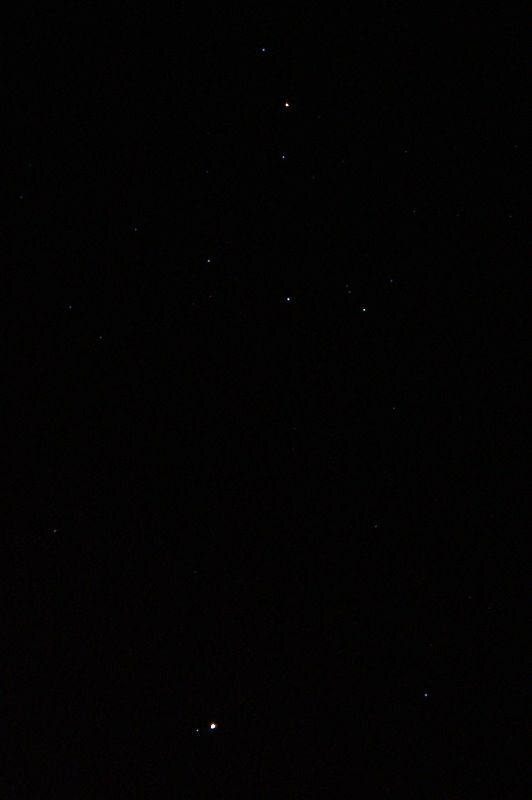 I think I'll go back and restack some of my Orion and Crux images. Over at Tom's he reports that the Shuttle launched successfully (I started to watch the countdown at NASA, but fell asleep). Some debris hit the shuttle 2 minutes 1 5 seconds into the launch, but the NASA shuttle page suggest that nothing is wrong, although they are still inspecting the heat shield. 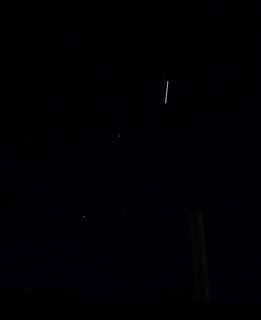 So what about seeing the shuttle, well, you can see the ISS with the shuttle nearby (later docked) as a bright dot streaking overhead (ulness you have a fast tracking telescope and a web cam). Pop over to Heavens Above for predictions of the visibility ISS and STS-115 (the current Shuttle mission) for your site. Sadly from Adelaide all the passes bar one are around 5 am in the morning (Sigh). Monday mornings pass should have the STS-115 3 minutes ahead of the ISS, separated by about 60 degrees. Tuesdays pass prediction has them quite divergent, but I would check closer to the time as orbits get updated. Someone got to see the partial eclipse. Go here for some nice pictures from the Philipines. SMART-1 Kicks up some dust. SMART-1 is still making a splash days after the impact. Over at the ESA site there are new animations of the impact flash. Now you can see the dust cloud kicked up as well. There is also a wide field animation of the impact. All these come from Canada-France-Hawaii Telescope (CFHT) . See here for the CFHT SMART-1 impact page. The crew have been posting their responses to ID Mavin Jonathon Wells latest book. Check out my essay on "irreducible complexity" (which I wrote in bewteen marking essays, submitting papers, watching SMART-1 crash on the Moon, failing to watch an eclipse and helping my son design a wind powered car). If you look to the west in the evening, you will see Jupiter close to the exotically named Zubenelgenubi (more prosacily Alpha Librae). Over the next week Jupiter comes withing 30 minutes of arc (about half a finger width) of Zubenelgenubi, being closest on September 13. 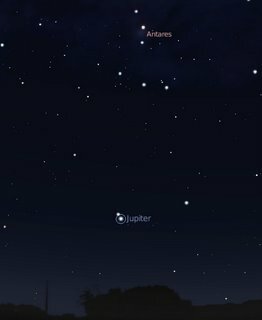 This will be attractive to watch over the next few days, and nice in a pair of binoculars or a low power telescope eyepiece so you can see Jupiter's disk and the twin stars that make up Zubenelgenubi. Says it all, really. Rechraed my cameras batteries, cooled down the telescope hours ahead of time. Sky looked clear and inviting, then cloud happened. Late in the eclipse the Moon peaked out quickly a couple of times, so I could see a chip off the edge, but othewhise, a good view of cloud. 92% scored lower (less nerdy). Remember the competition to make a new menomic for the names of the planets? Okay, the results are in ... and you all win. Karen, Ethyl, Cary S, go here and send me an email with an appropriate contact address* and your copy of Sky& Space will be on its way. John, I'll bring a copy up with me in September. *All information sent to me will be strictly confidental and nothing will go to evil spammers or telemarketers or evil Squid Overlords. The western morning sky at 4:45 ACST Adelaide. Similar views will be seen in the Southern Hemisphere at equivalent local times. Night Owls will have a bit of a show in the very late evening of Thursday 7 September and early morning Friday 8 September. At roughly midnight on the 7th (roughly 10:00 pm in Perth), the Moon will occult Uranus. This is strictly a telescopic occultation, as Uranus's measly 5.7 magnitude will be drowned out by the Full Moons light. Still, even in a modest telescope Uranus's tiny disk should be seen going behind the Moon (for local occulation times see here). 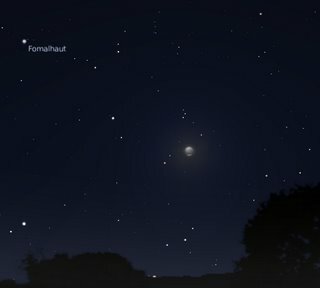 The Full Moon will be high in the sky, and Uranus should be obvious in a telescope. If you wait a few hours after that (roughly around 4:00 am except WA, which is more like 2:00 am) , you can see a Partial Lunar Eclipse. Visible mostly in Australia, SE Asia, India and East Africa (see visibility map here), it won't be spectacular, only 19% of the Moon will be in Earths shadow, but it will be better than the last eclipse we had, and fairly nice. Local contact times for Australia are here. In an earlier version I wrote that Darwin will miss the eclipse, it won't, it will see the whole thing. Pop over to the ESA site for some of the latest from SMART-1 . There is an animation of Earthrise as seen by SMART-1, and animations of some of the final orbits. Still no death dive images though, but lots of cool science. Not too much at this stage. A great webcam animation of the impact from amature astronomer Peter Lipscomb. (hat tip to Paolo Amaroso via Bad Astronomy Blog). ESA has put out some more images, but not from the actual Death Dive. Fathers Day with added Spacecraft Impact. Image, Dr Who and an anonymous Dalek watch SMART-1 crash into the Moon. 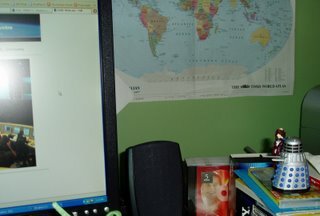 While waiting for SMART-1 updates, I thought I'd tell you about my day. Today is/was Fathers Day in Australia. I got to lounge in bed while the boys "assisted" my beloved Bettdeckrerschnappender Weisle in making muffins. You can see the image below, I'm using it as an illustration in my lecture on food additives and toxicity (seriously, just redid the slides). I also was presented with a Dr Who collectors set, part of which can be seen in the image above. It's a bit thought provoking that Smallest One can't name colours, but can say "Dr. Who". Breakfast at the astrobloggers. 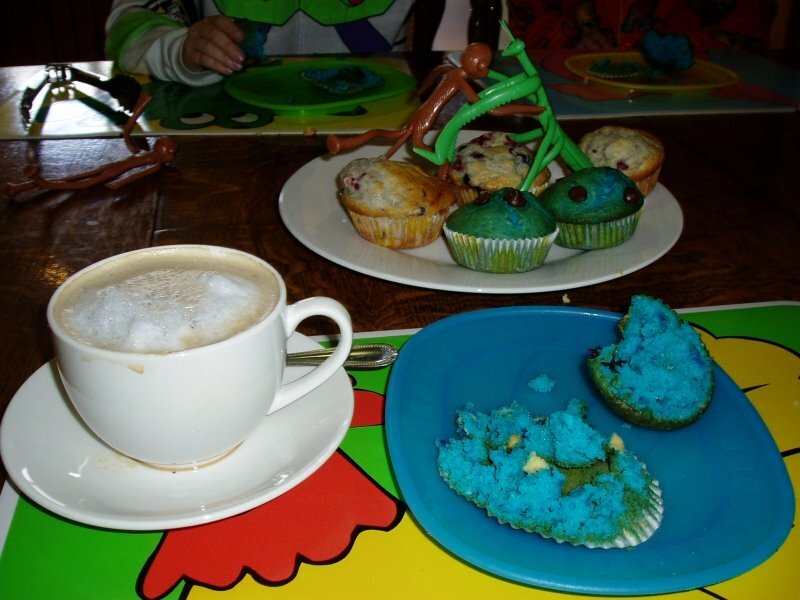 It looks yummy (yes, that's a giant Preying Mantis either hugging or battling a monkey, the significance eluded me too). The we went down to the foreshore and did some feral weed removal with dune care, retired home and the boys, Dr. Who and I watched SMART-1 crash into the Moon via the ESA webcam. The we watched Prehistoric Park on TV before I sent them to bed (Middle One wants a Microraptor as a pet), and checked on the crash reports. Is it possible to have a better day? New Scientist reports that the Canada-France-Hawaii Telescope (CFHT) caught the flash of SMART-1 impacting the Moon. You can see an animation of the flash sequence here. 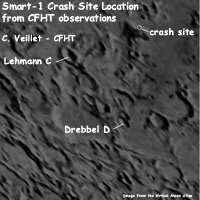 SMART-1 hit the Moon at about 7200 kilometres per hour and should have blasted a crater 5 to 10 metres wide. This may be visible in big amateur scopes (well, the ejecta blanket anyway). In the meantime, the ESA has released a simulation of SMART-1's final moments, plus images of the approach path and some of the last science images (from a few days ago). Still waiting on the death plunge images. This series of images (click on them to enlarge) are screen captures from the ESOC webcam feed, of what I think are the last moments of SMART-1. Given that there was no commentary, or cluse as to what was actually on the screens, I'm pretty much geussing that the one screen that kept updating, and that people were staring at and photographing, was actually a live feed form SMART-1 (heck, it could have been "best of SMART-1 for all I know). Amyway, SMART-1 impacted pretty much on time, and was sending back images up to 5 minutes before impact. The Planetary Society Weblog has more details. So far no reports of visual impact form Amateur telescopes. The ESA are working on getting up the images from the last moments of SMART-1, but until then you will have to putt up with my fuzzy Webcam pics. UPDATE: ESA has released simulation of SMART-1's last moments. SMART-1 impacts in 1 hour 13 minutes! In just over 1 hour, SMART-1 will impact the Moon. We won't see it from the Southern Hemisphere (except for parts of South America), bet we can watch the ESOC webcam, live from mission control. Stuart has a whole bunch of links and rescources for you over at his SMART-1 post. So better head over there. (the Bad Astronomer has some good stuff as well). Update: 8 minutes to go, looks like the SMART-1 cameras are still transmitting. Run, don't walk, to Tom's Astronomy blog for a shaow transit on Uranus. You'll love it. That dot above the solar occulting disk in the SOHO C3 image is Mercury. The line through it is an artefact. Mercury is at Superior conjunction today, and will return to the evening skies later this month. 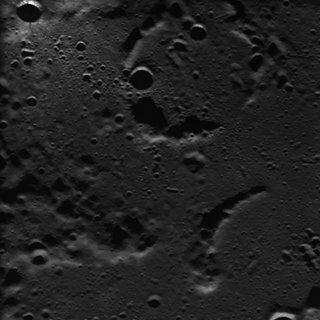 You can watvh a video of mercury approaching here. Late September early October will be the best time this year to see Mercury in the evening skies, followed by a transit on November 8. 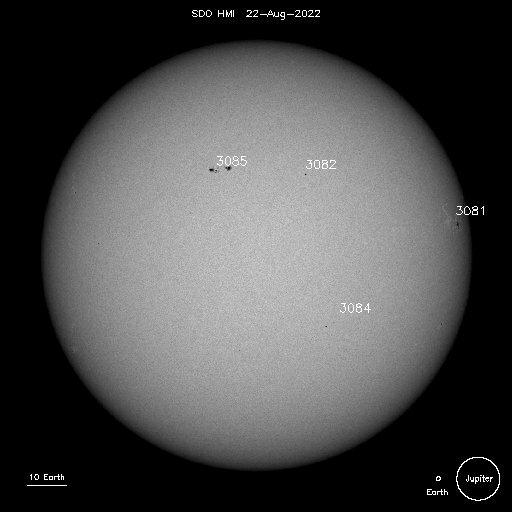 In other Sun-related news, Sunspot 905 has a reversed magnetic polarity too, so it looks like Solar cycle 24 is here at last. I think my students might agree. Parentetically, I use a doll of Beaker as an ice-breaker in my tutorials. Via blog around the clock.